The Auster AOP.3 was the first in a series of air observation posts designed by Auster Aircraft Ltd. It saw wartime service from 1943 and evolved into the AOP.6, of which 296 examples were built for the RAF and the Belgian Air Force, together with 36 of a slightly modified version for the RCAF. The AOP.7 was a two-seat dual-control trainer version, while the AOP.8 was intended to combine the features of both Mk.6 and Mk.7, but was not furthered. Last in the series was the AOP.9, a tough and versatile monoplane which first flew on 19 March 1954 and incorporated many lessons learned during the Korean War, in which the AOP.6 was used extensively by the British Army for artillery spotting and other duties. The first AOP.9s were issued to RAF units at the beginning of 1954, and a second order followed in 1959. Austers of various marks were also used by Iraq, Jordan, Rhodesia and South Africa. I just thought you might be interested to know that G-AVYU (VH BGL) WJ 401 AOP6 is still alive and well. I have the privilege to fly her nearly every week down here in Oz. Ron Rankin just sold the AOP 9 to myself and it is located in Richland WA and planning on a restoration. I was fortunate enough to meet Hugh Orr who was sent for training on 2lb Anti Tank Guns at the beginning of WW2. He was very lucky in that he could fly and was whisked away to an Auster AOP squadron. The 2lb Anti Tank gunners were nearly all killed. I know he saw many actions, one being a German Armoured breakthrough where he called down Artillery fire on their formations. He told of the Auster being very high and huge artillery shells reaching apogee along side the little Auster, rotating on their axis just before they continued their ballistic trajectory earthwards. off the aircrafts canvas, by a herd of cows! I flew a few times in Army AOP 7s and 9s from Idris, Libya in the 1960s, usually with no doors (very hot) and an army pilots anxious to practice their fieldcraft (using the dead ground and all that). Renewed acquaintance at RAF Odiham in the 70s. Some enterprising officer had acquired a couple of AOP Austers use as a station hacks. A parcel of Bombardier engines had come with them and it was rumoured that if anything needed engine work done, it would simply be changed. Happy days! I flew in AOPs 6 or 7?,one may have been a 9 in Hong Kong in the late 1960's as an Aux Police Air Observor with the H K Aux Air Force There were three servicable, said to have come from the Army last used in Malaya emergency? We dropped news papers on to school playgrounds in out lying villages in Sai Kung and the off shore islands.In emergency we were expected to report on ground disturbances back to Pol/Mil HQ to give Police air support. Fun days. In 1970 one crashed into the harbour taking off from Kai Tak,a fatality ensued. As a 12 year old kid living at Larkhill 1954, I spent summer holidays roaming Salisbury Plain. Army Auster pilots frequently landed on the open grassland for a break. Rare to meet pilot's on a one to one basis and most were pleased to chat for a while about how things worked and with a bit of luck they'd take off with one delighted new observer on board! 30 minutes of airbourne bliss seeing artillery, tanks and troops and abandoned Spitfires used for target practice (sacriledge!). Splendour Stonehenge and of Salisbury Cathederal from above as we flew around them. By 1968 I was a BGA gliding instructor and flew the Auster JIN to receive my PPL licence No 84448. From 1969, towed RAFGSA gliders using ex-army AOP Auster G-AVYU at RAF Cosford. This aircraft is now in Australia registered as VH-BGL. I learned to fly on Austers at Blackpool airport on Autocars and Autocrats. They had to be hand swung to start ie no electric start. I remember some had Cirrus Minor engines and others Gypsey Majors. They were quite noisy but I'm glad I learned on taildraggers as since I've never had a problem landing any othe aircraft. I flare them just like an Auster. My first instructor told me "If you don't get that stick all the way back (during the flare) it's going to go up again". This was the three point landing system of course - NOT a wheel landing. 35 years later I flew a Piper J-3 Cub taildragger with no problems at all thanks to my original Auster training. In 1954 While I was studying for my second Mates certificate. enthralled all of us with his tale about how a Gerry fighter had spotted him flying at tree-top level counting Gerry troops and tanks, and since the gerry pilot couldn't open fire on him, he flew round in circles over the enemy soldiers till the gerry fighter pilot had to give up because he was burning up all his fuel. The stories flowed in abundance when all the fliers met in the pub. It was a memorable event learning to fly the Auster. Question: How slow could the Auster fly comfortably at tree-top height? I now own an AOP-9. This aircraft had spent the last 20 years in Sarasota, Florida. It is now in Yakima, Washington , USA, undergoing restoration. Any information and parts would be appreciated! 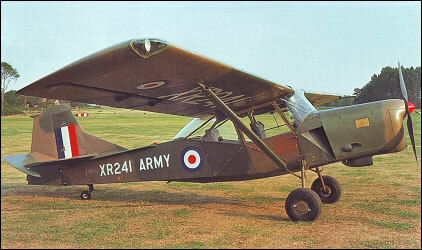 I remember flying in Auster 6s and 9s at the Army Air Corps base at Middle Wallop as an ATC cadet in the late 50s. It was fun to fly in as it had good forward and side visibility and was readily responsive to controls. there were 8 Austers in action in the Korean war . They flew hundreds of hours both in aop and light liason work. I comanded the army airfield at Uijongbu ('I' Corps) in 1951. We had the one Auster assigned to support the Commonwealth Division based here. I forget the name of the only pilot, but he was a very personable 'chap', and a pleasure to know and work with. This comment is being made only to place into perspective the above comment that the Auster "was used extensively in Korea." Extensive in that the sole specimen was well utilized, but how extensive can a single unit sample be?